I like how sophisticatedly vampy this is, and all that ruching is extra-flattering. A clean-lined and well-priced floral. 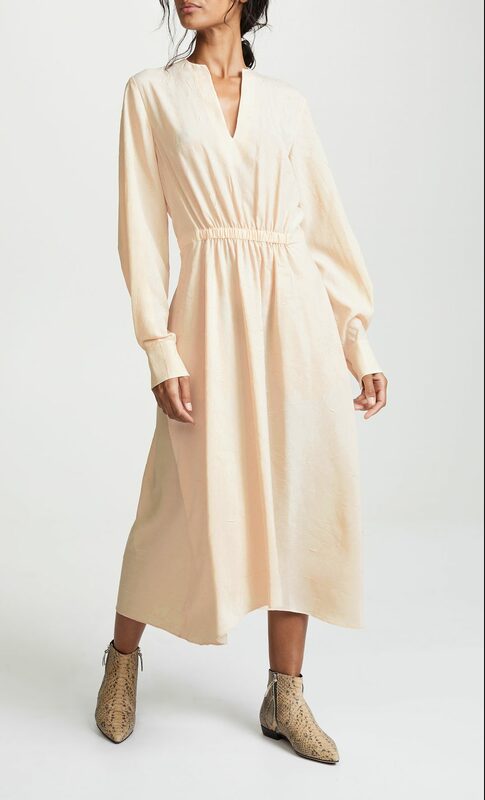 A silky shirtdress that seems quite versatile. I’d layer it with a long-sleeved tee underneath once it turns chilly. 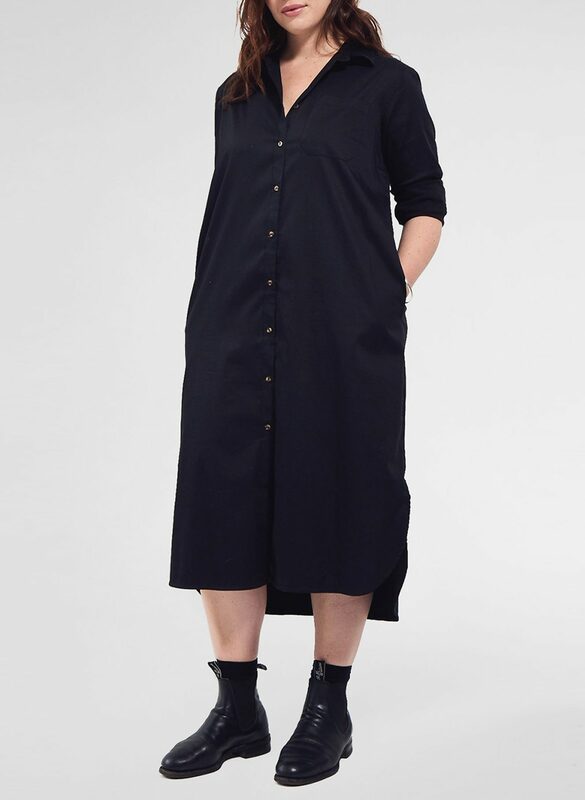 And here’s another shirtdress I like, from Universal Standard. The knotting here adds just the right amount of interest to an otherwise pretty straightforward dress. I’m just crazy for the color combination here—the white stripes really pop. 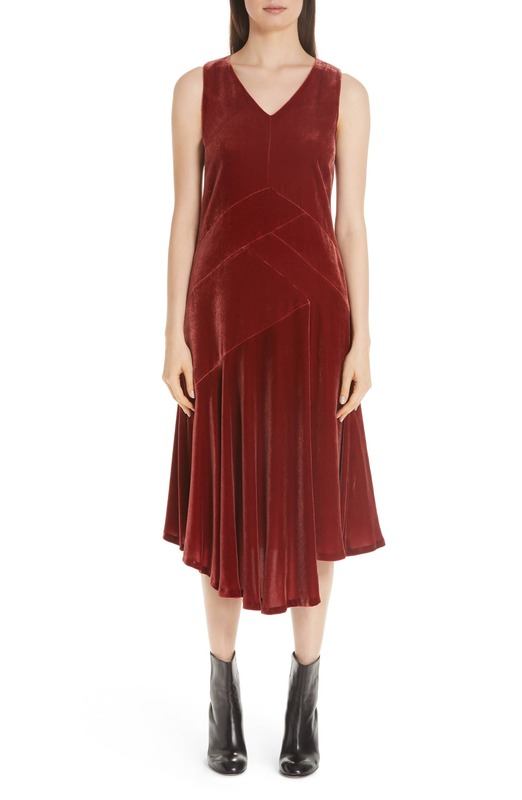 A glorious (and rather spendy) velvet number that’s just gorgeously cut. I love the idea of a white dress in the fall and winter, and this one just looks so wearable. The plaid pattern and black details make this one rather retroishly appealing. I don’t usually go in for so much ruffle, but this is just so pretty. I dig the deep neckline here. Just a really pulled-together option that’d be perfect for the office. 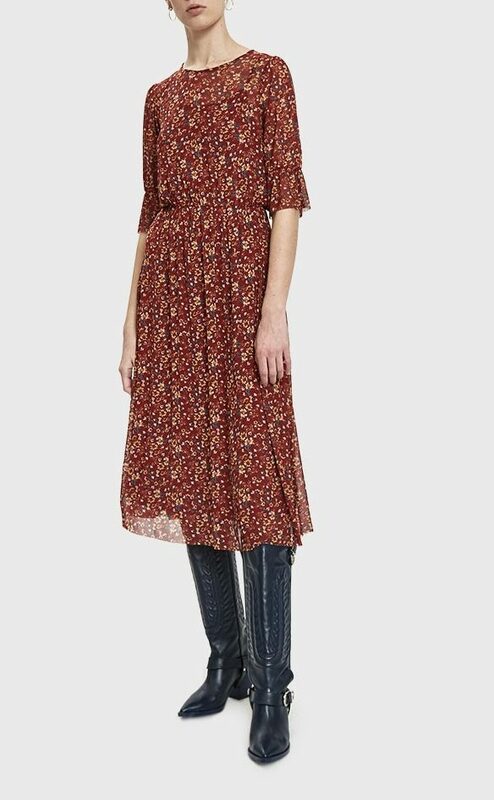 This is a pretty summery-looking dress, but it’d work for fall with big boots and a shrunken cardigan or leather jacket. A cute tee dress with a becoming waistline. 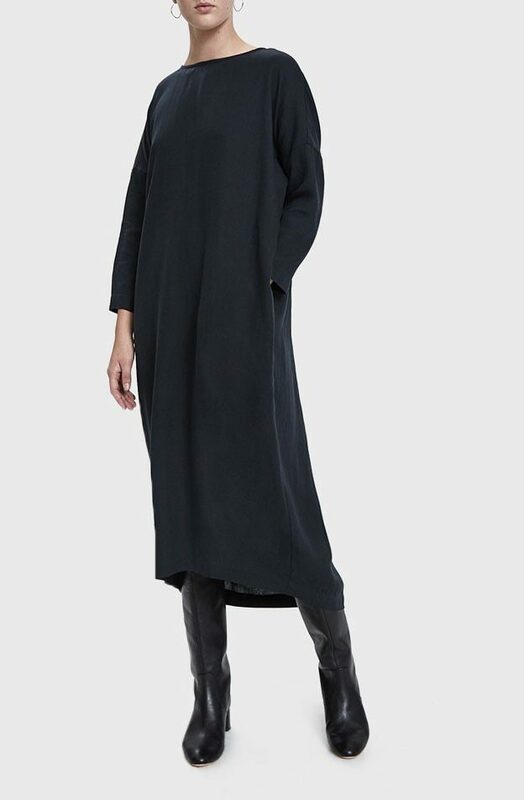 This cocoon dress is what to throw on for days when comfort is absolutely essential. 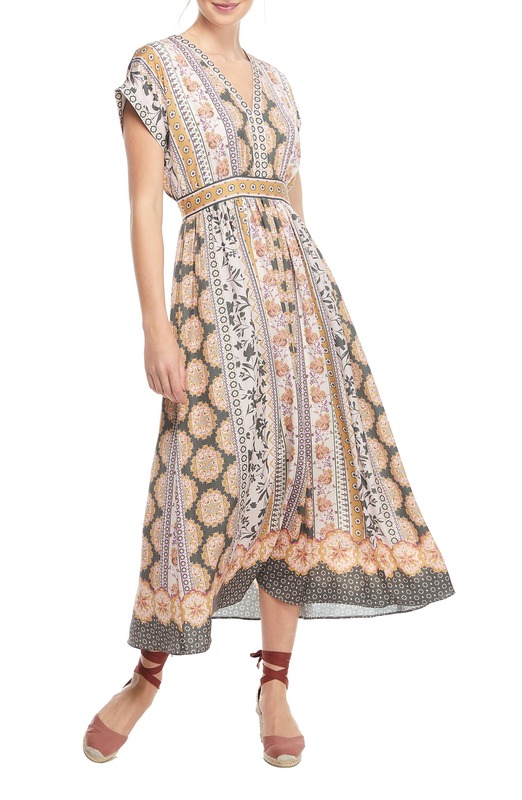 A fairly glam version of a hippie girl dress. Well done! I would wear all of these. And I love all the black boots with the just-right heels, too. A worthwhile piece of information: I tried the dress “The knotting here adds just the right amount of interest to an otherwise pretty straightforward dress.” And it was very small, the fabric showed every little hump and bump. This was two different sizes. I was surprised! Had to return them. 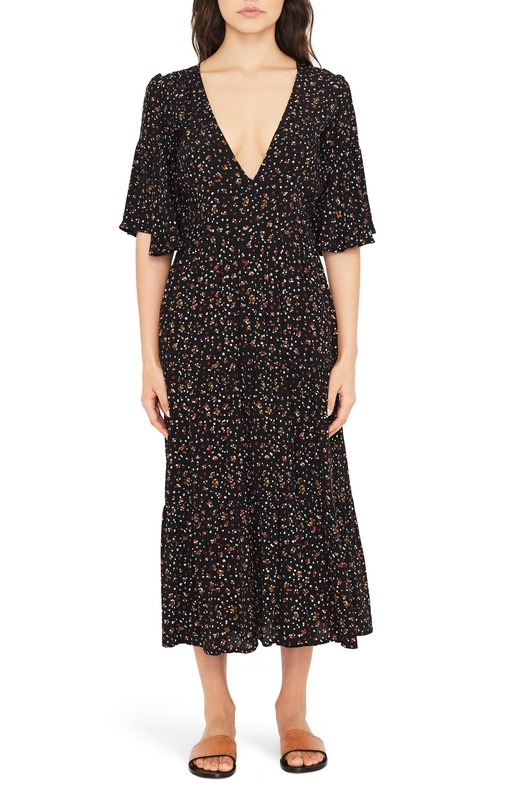 A worthwhile piece of information: I tried the dress "The knotting here adds just the right amount of interest to an otherwise pretty straightforward dress." And it was very small, the fabric showed every little hump and bump. This was two different sizes. I was surprised! Had to return them. I’m loving the deep-vee semi-wrap styles. But I’m going to try my hand at being creative and pull out the new sewing machine. Anyone have suggestions on a good place to order fabric online? I don’t, but I agree it can be hard to get to a fabric store. Though once there, I enjoy it. Or, I assume stores are willing to send you a few free swatches. I am a total newbie but I would think fitting a wrap-top might take a few tries. So reasonable price muslin might be the first place to start? It would be pretty exciting to get it right though, bc that’s one of my favorite styles too, it never really goes “out” (not that i care), and it is hard to find a good one in stores that’s not a jillion dollars. Hmm. Unless it would be better to use something with stretch, then I would assume the “muslin” would need to be stretch too. Well, maybe a real sewer will come along here and give suggestions. Good luck!! I hope you will let us know how it goes! I don’t, but I agree it can be hard to get to a fabric store. Though once there, I enjoy it. Maybe see if you could find a local meetup? they might have sources and it would be fun to get an idea of their taste. I would say my media consumption of sewing shows v. actual sewing is at least 10 to 1. Sometimes I can learn something potentially useful even though I usually have noooo interest in whatever it is they’re making. It’s fun to see what other people like (as here!) Or, I assume stores are willing to send you a few free swatches. I am a total newbie but I would think fitting a wrap-top might take a few tries. So reasonable price muslin might be the first place to start? 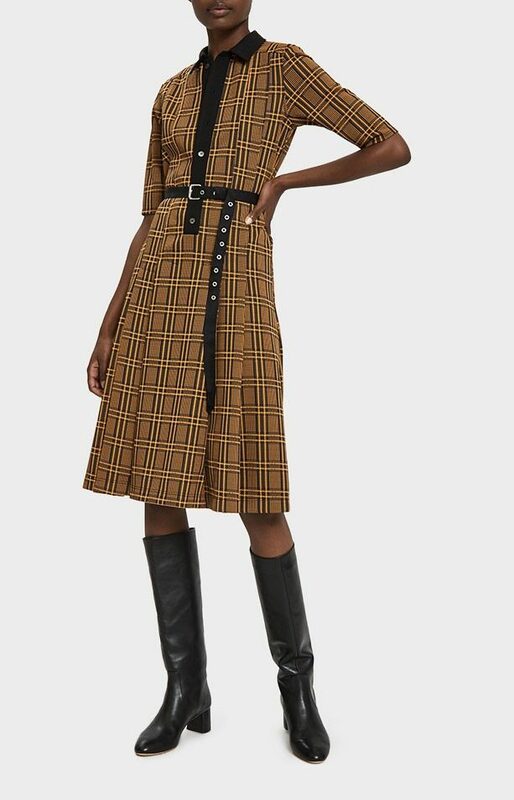 It would be pretty exciting to get it right though, bc that’s one of my favorite styles too, it never really goes “out” (not that i care), and it is hard to find a good one in stores that’s not a jillion dollars. Hmm. Unless it would be better to use something with stretch, then I would assume the “muslin” would need to be stretch too. Well, maybe a real sewer will come along here and give suggestions. Good luck!! I hope you will let us know how it goes! Zounds! My paragraphs are gone! Oopsie. Oh well. It’s funny bc I egregiously over-use them! Same with these !!!! That rust-colored velvet dress has such a beautiful 1930s line. I was particularly drawn to the bias cut and how it’s nice to the body. That rust-colored velvet dress has such a beautiful 1930s line. I was particularly drawn to the bias cut and how it's nice to the body. This one makes me drool!! 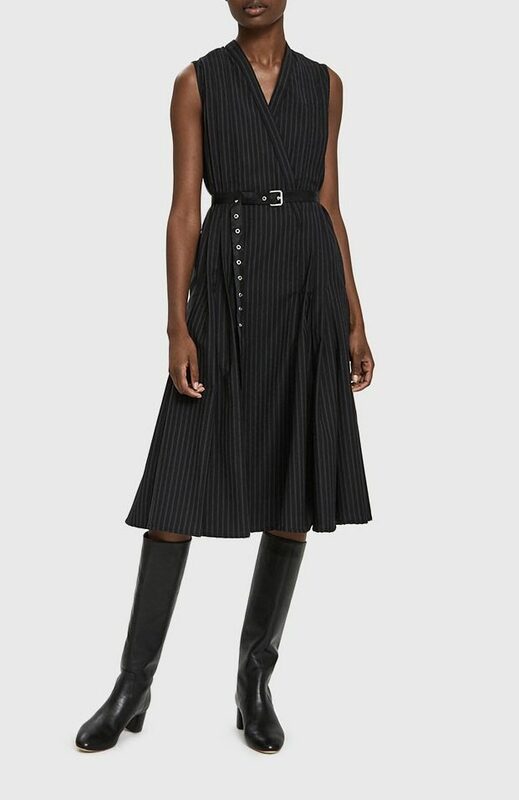 These are all glorious, especially the All Saints knotted dress and the Norma Kamali. I love that turtleneck under shirt look. Very Mary Richards. Beautiful! 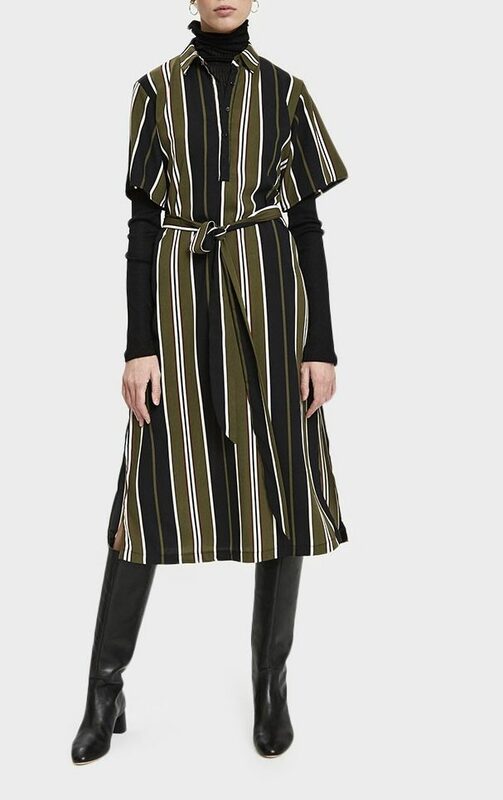 That All Saints dress is fabulous and on sale, too! I have the Universal Standard dress & it’s fabulous. It looks great on, has deep pockets & transitions well between seasons with change of under layer and sandals to boots. 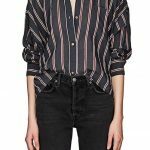 The fabric is a crisp, stretchy cotton that washes easily in the machine, hangs to dry & never wrinkles. I have the Universal Standard dress & it's fabulous. 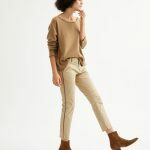 It looks great on, has deep pockets & transitions well between seasons with change of under layer and sandals to boots. The fabric is a crisp, stretchy cotton that washes easily in the machine, hangs to dry & never wrinkles. How do you style it? It’s so loose and boxy that I’m afraid I will look either two sizes bigger than I am or 8 months pregnant. Do you belt it? Or does it drape in a way that makes it not look like a tent? How do you style it? It's so loose and boxy that I'm afraid I will look either two sizes bigger than I am or 8 months pregnant. Do you belt it? Or does it drape in a way that makes it not look like a tent?